The project is an effect of a collaboration between programmes – IxD MA and Advanced Product MA. Our goal was to propose a solution that will strongly rely on sound experience. We decided to focus on a direction related to allergies and situations where sound can make the biggest impact. ISA10 is an intuitive auto-injector designed to deliver an Epinephrine dose for patients suffering from a severe allergy attack. 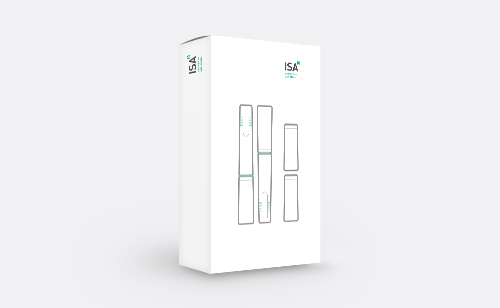 ISA10 uses sound and light to guide the user through the injection process, ensuring correct usage of the device. a self explanatory auto injector? Depending on the situation, alarm sound emitted by ISA10 can be turned on by using one tap in the app or by shaking bag or backpack it is kept in. 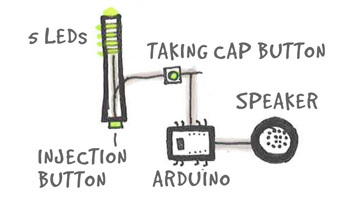 Alarm sound is supported by a light animation that helps finding the device even if it is deeply hidden in a backpack. After removing a cap the user gets an instant feedback that the device is ready to use. Sound and a light animation improve confidence of the user during this stressful situation. The ?charging effect? helps user to understand how the device is working and that sound and light will guide him/her during the injection process. To make an injection properly the device needs to be hold on the tight for 10 seconds. Sound and lights constantly inform user about the progress so user doesn?t have to count this time by himself/herself. After the injection is completed, application connects patient with the nearest hospital. It is a necessary step since after each application of Epinephrine medical consultation is required. We started our design process with internet research to better understand the challenges that our users are coping with and to get acquainted with existing solutions that they need to rely on. To understand the context we looked into severe allergies. What triggers them and what is a procedure when having one. We found out that taking two injectors is always challenging and sometimes their strongly medical look makes the user feel uncomfortable in the public. We have decided to dedicate our solution to young adults. Early adulthood is the transition time when patients become responsible for their own medication. Meanwhile it is not uncommon that they enter new environment of school or work where stigmatising injectors might feel like a burden. Existing solutions don’t provide clear instructions on how to use the device and have usually only visual information what excludes people with visual impairment. The majority of self-injectors manufacturers don?t provide information on the time span of usage and make its usage intimidating and complex. A patient needs to receive an Epinephrine injection within minutes from the beginning of the allergy attack, but according to the research 84% of patients misuse auto-injectors. Data source: Snack Safely. Natural next step was to talk with people that have allergies. We interviewed three people with different level of allergies. One of them has severe allergy and is the user of an auto-injector. The statistics of misusing auto-injectors showed that there is a big opportunity to use sound and light to guide the user to perform the process correctly. Our goal was also to minimize the stress of the user during an allergy attack through experience of sound and light animation. A lot of users perceive injectors available on the market simply as ?scary?. In our process we wanted to address user?s needs and focused on making the device as easy and encouraging to use as possible, while ensuring it has a very clean look. 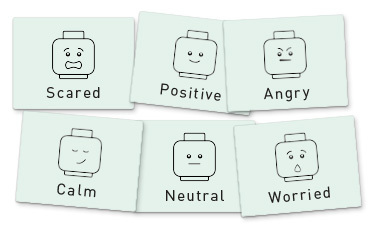 Through interviews we learnt that having an allergy can be intimidating and influence user?s relations in a society. Less medical look will minimize anxiety toward the device. Also sleek design will allow users to handle injector in public without the feeling of stigmatization. With knowledge from research and interviews we started to brainstorming on solutions that we would like to include in the device. Out of many (sometimes crazy) ideas we chose the ones that would be feasible to verify during the time we were left with and we started testing them immediately. In the first research we asked users to perform three tasks: initial walkthrough of the injection process with the sounds being played from the computer, presentation of simple light-sound animation and marking emotional reaction for each sound. A pen prototype was created to test if the sequence of interactions is understandable without detailed instructions. We placed five LEDs SMD inside a plastic tube to mimic the light interaction and connected them to Arduino Nano to trigger actions through push buttons. We invited 4 users to test our solution. They were asked to perform procedure of injection without a prior description. All of them who have never used auto-injector before, performed the task correctly. Infographics illustrate how ideation process looked for different actions performed by the device. Name and logo remind user about 10 seconds of injection time. The product has minimalistic and clean branding, designed in a way to become a first instruction for a new user. That is why on a packaging the lights are highlighted and suggest their behaviour during injection. ISA10 can be used as a stand-alone device or synchronized with a simple mobile application. 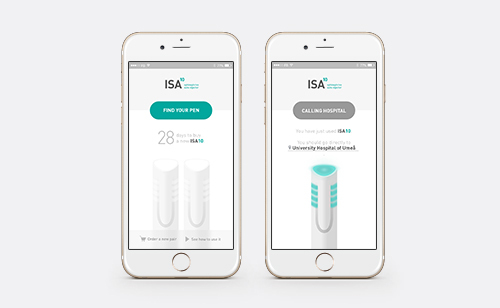 Mobile application accompanying ISA10 can contact hospital, help locate auto-injector, provide reminders about the expiration date and ask doctor?s office for a prescription renewal. As a result of form exploration we proposed a triangular shape for the main body of the device. It provides not only a firm grip, but also prevents the device from rolling away when placed on a flat surface. Conical shape helps to keep it at the right angle when positioned against the thigh. 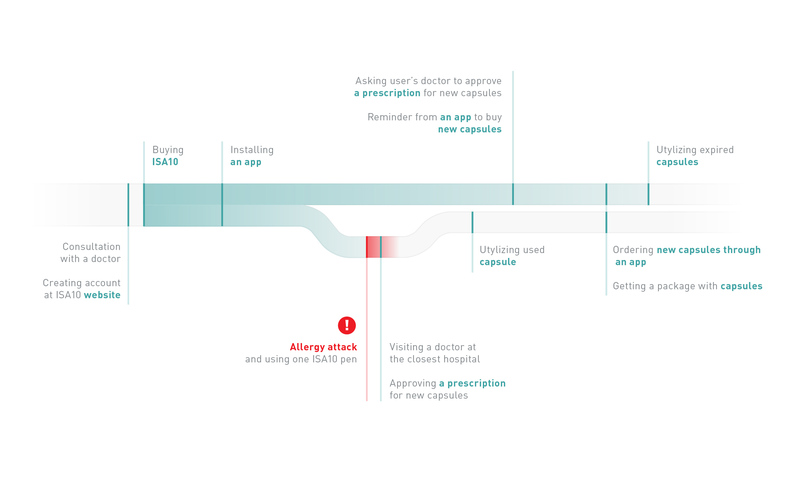 Infographic presents a journey in scenario when the user is using ISA10 mobile app. A journey is defined to simplify process of buying new capsules and utilising old ones. Device guides users with sound and light ensuring its correct usage. The sequence of sound and light indicating the duration of the injection is preventing one of the most common mistakes – not keeping self-injector long enough on the thigh. Color coding and shape of the device help to place it in a correct position while ergonomic shape gives a good grip. While other solutions on the market are fully disposable, ISA10 consists of disposable capsule and reusable handle. This solution decreases the cost of a single injection, is more sustainable and helps to establish more personal relationship with the device. Also it creates less medical waste that needs to be handled by the users according to the local regulations. Less intimidating look of the device minimizes users anxiety towards auto-injector. Furthermore sleek design allows users to handle injector in public without the feeling of stigmatization. 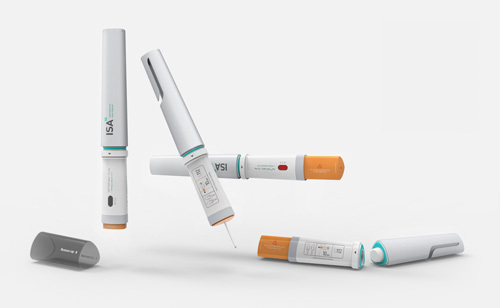 Since the user needs to carry two auto-injectors, ISA10 is fitted with magnetic attachment which makes it possible to connect them. It?s also thinner than other injectors, allowing to be carried in small purses and pockets. I was involved in all stages of design process from research to execution with a main focus on making an interactive prototype, a mobile app and branding of the product.